This past weekend a friend and I headed down south to spend a couple of nights in Jupiter at the Courtyard Marriott Palm Beach hotel as part of the Wish You Were Here – Florida campaign. 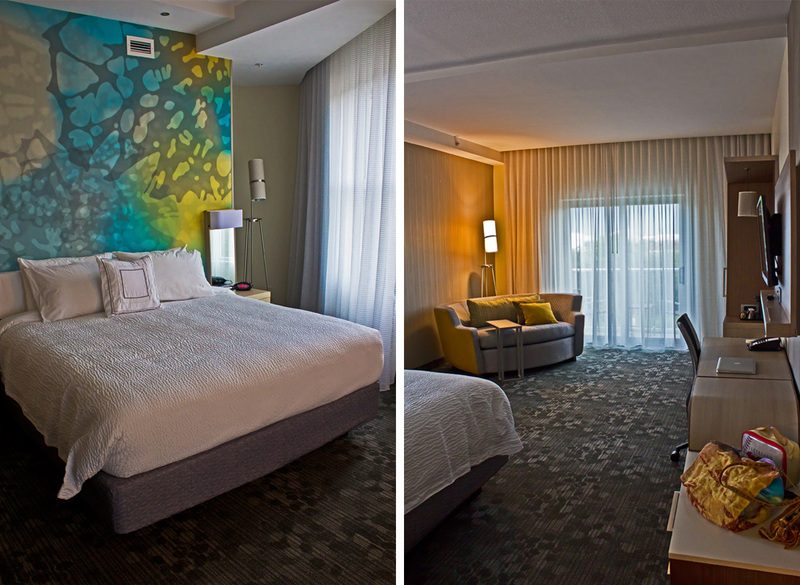 The hotel is one of the first Courtyard by Marriott hotels in Florida to feature the brand’s new Cynergy design so I was excited to check it out. I’ve stayed at Courtyard’s in the past and while they were always decently priced and provided me with a roof over my head, a bed and a bathroom, they always seemed to be in need of a serious upgrade and some TLC. 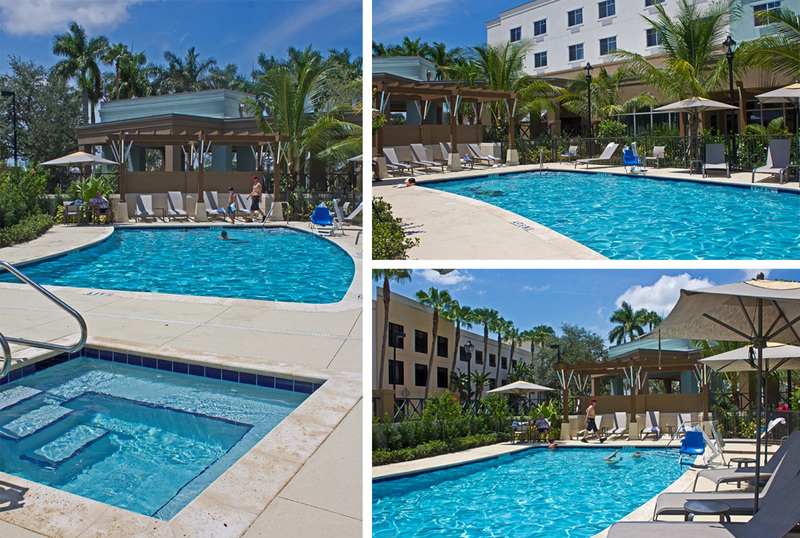 The Courtyard Marriott Palm Beach Jupiter only opened its doors on June 5 of this year, so it is a brand-spankin’ new hotel. 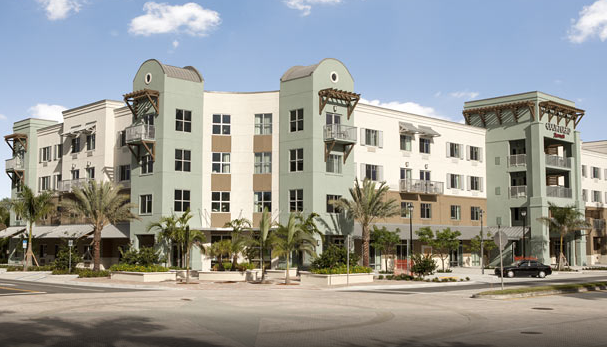 The 128-room hotel is one of the first Courtyard by Marriott hotels in Florida to feature the brand’s new Cynergy design. The concept behind this design is to incorporate sophisticated details into functional spaces – it features plush bedding, brightly lit bathrooms, and clutter-free areas for work and relaxation. Courtyard prides itself on evolving to meet the changing needs of its guests, they do this by constantly researching new and upcoming trends. Today, the average teens, millennials, and business travelers are very tech-savvy, driven individuals. Within the last few years alone, technology has changed the way people travel, and that has definitely been reflected amongst the Courtyard’s new layout and design. 2. Electrical outlets EVERYWHERE *be still, nerd heart*. 3. The awesome feature wall behind the bed. 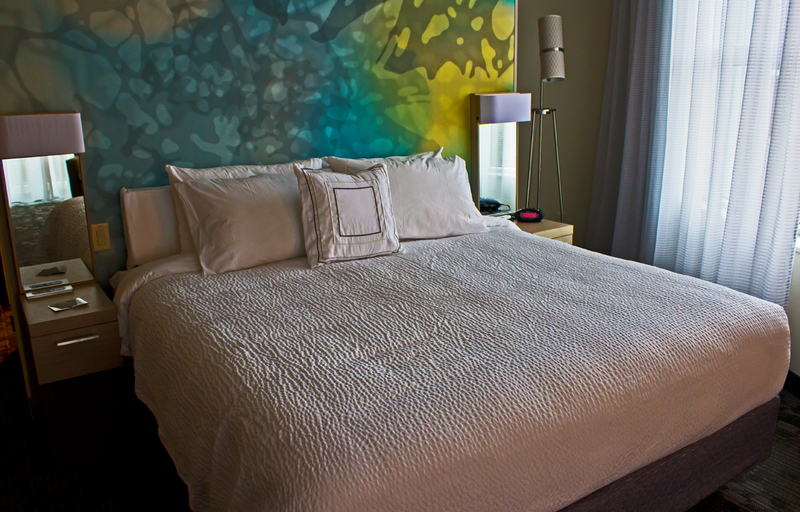 The latest room designs offer hybrid zones for working, sleeping, relaxing and getting ready. Indirect lighting and a neutral, tone-on-tone color palette makes for a soothing and calm environment, with a splash of color thrown across a feature wall to really give the room that wow-factor. Signature furniture and architectural elements replace a lot of the old, retired-look furnishings that most of the older Courtyard hotels incorporate. 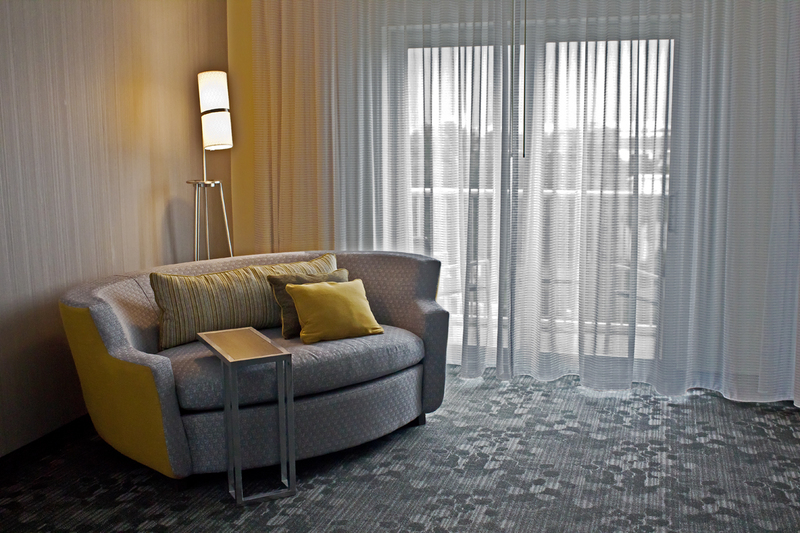 The room features a lounge area with a cute little sofa for relaxing and working, as well as a desk on wheels allowing you to work from anywhere within the room. I tend to have a short attention span so I was a big fan of this feature – if I find that I’m sick of staring at the wall, I can simply get up, move the desk to the window, and boom, a whole new working environment created – pretty awesome. 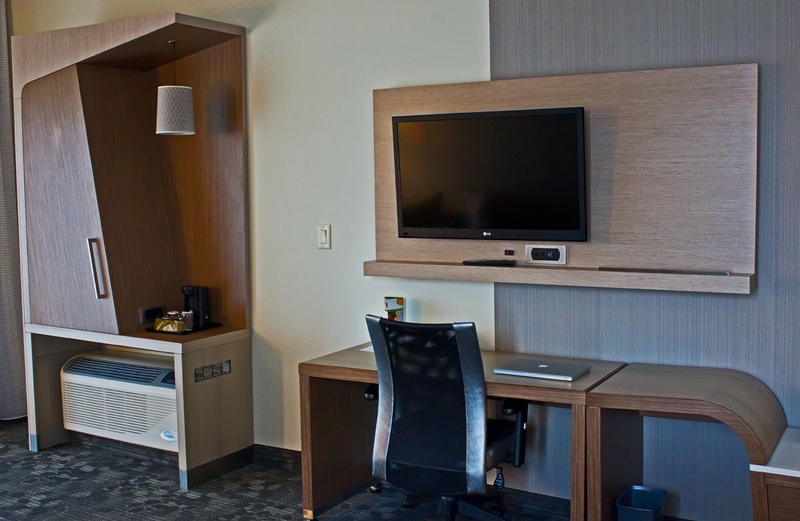 The complimentary Wi-Fi was amazing and has almost become a must-have for me when I travel for both work and leisure. I feel extremely ripped off when a hotel tries to charge me $24 for a 24 hour Wi-Fi pass. As silly as this may sound, for me, free Wi-Fi ranks up there with shampoo and conditioner as a hotel necessity! The new room design offers flexible, yet comfortable spaces that enable technology lovers like myself to bask in everything electronic. 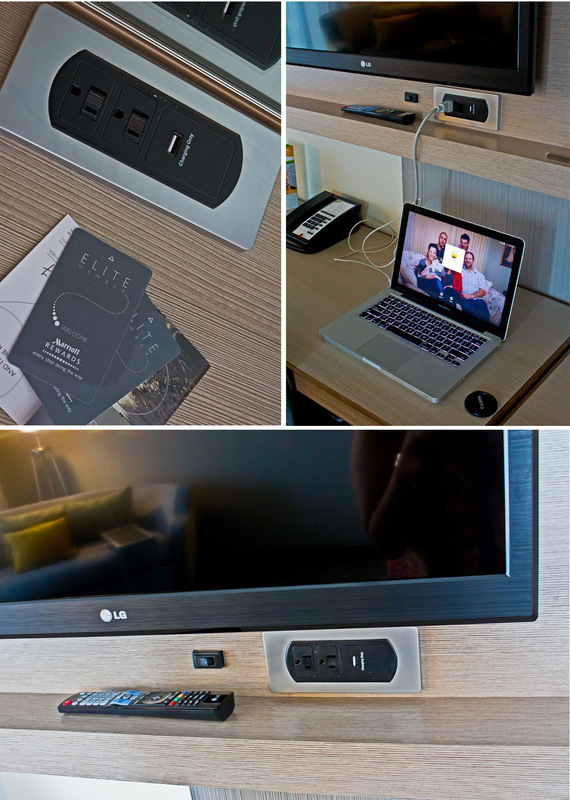 Not only does the room feature ample electrical outlets (I think I counted 14 in the main room alone), but there is a device ledge by the TV for seamless technology integration and charging. 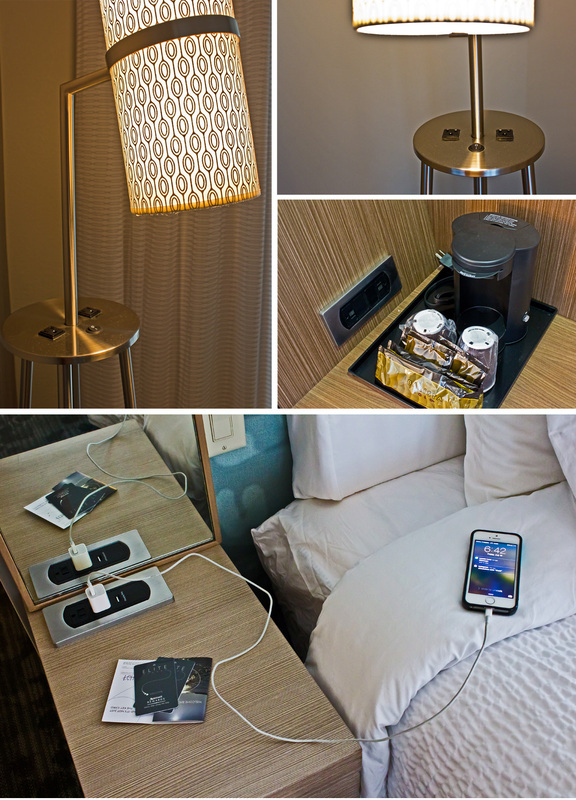 I always feel like I’ve hit the jackpot when there are outlets at my bedside table, but the Courtyard Marriott went one further by providing not only one, but two outlets at each bedside table as well as a USB outlet – my nerdy heart could not handle such excitement! At one stage I had my MacBook, iPhone, GoPro, a spare battery, and my DSLR charing all at once, and still had enough empty outlets to provide power to a small country! The bathroom was a surprising standout feature for me. 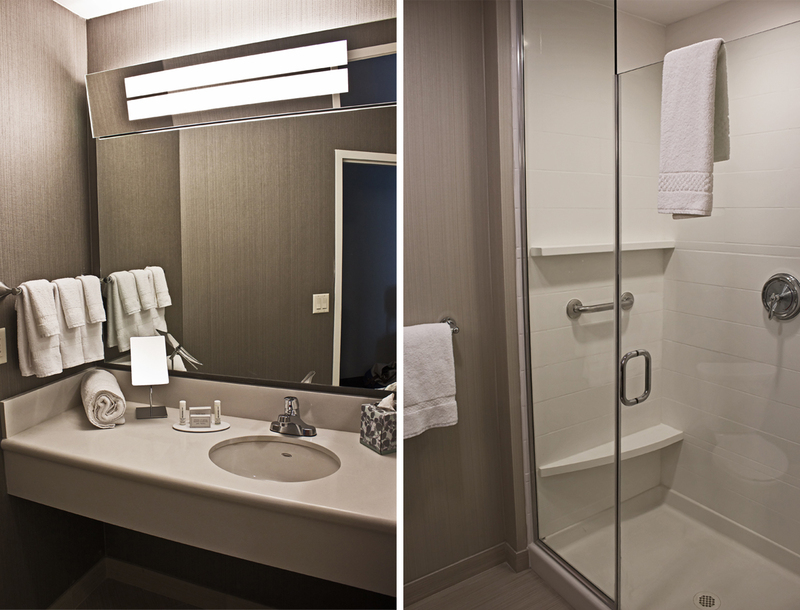 The Cynergy design provides an upgraded, more spacious layout to create an enhanced bathroom experience. Not only was there enough space for both my friend and I to do our hair and makeup at the same time, but there was also a huge standup shower instead of a tub which I absolutely loved. Ever since moving from Australia to the USA, I’ve missed stand-up showers (over tub showers) and always get excited when I come across one! 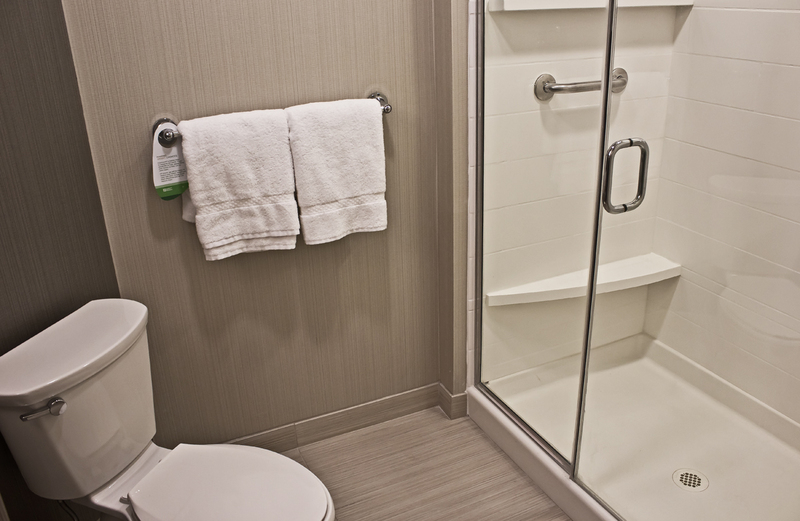 Inside the shower, there was plenty of shelves and nooks to house shampoos, soaps and towels. Lack of shower shelving at hotels is another thing I dislike, there’s usually a single soap dish and that’s it, but at the Courtyard Marriott, this wasn’t even an issue. We spent our Saturday afternoon lazing by the pool and soaking up the sun. While the Courtyard Palm Beach Jupiter does not boast the biggest of pools, it is still decently sized and at its deepest, measures 5ft. Luckily for us, there were only three other people occupying the pool while we were out there, but if 10-15 people were out at the pool deck at once, I think it would feel a little over-crowded. Surrounded by pool chairs and umbrellas, this was a great way to cool off and kill some time. Right by the pool, you’ll also find a small whirlpool, but it was way too hot out to put that to use! The lobby at the Courtyard Palm Beach Jupiter has an extremely sharp and refreshing look to it. 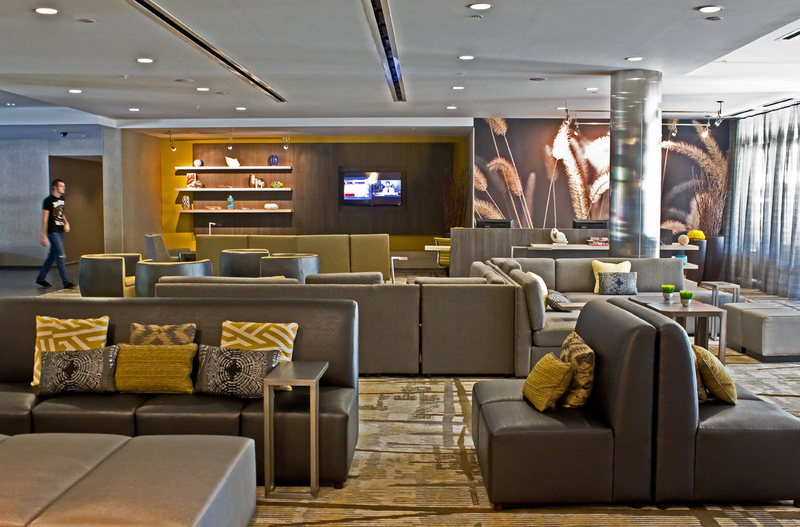 Along with media pods for charging and connecting personal laptops, the complimentary Wi-Fi and a variety of different seating zones, the redefined space is a great spot to hang out, chat, eat or watch TV if you want to escape your hotel room for a bit. We saw many people casually hanging out down here and groups of people sharing take-out dinners that they’d ordered-in, especially on Saturday night. 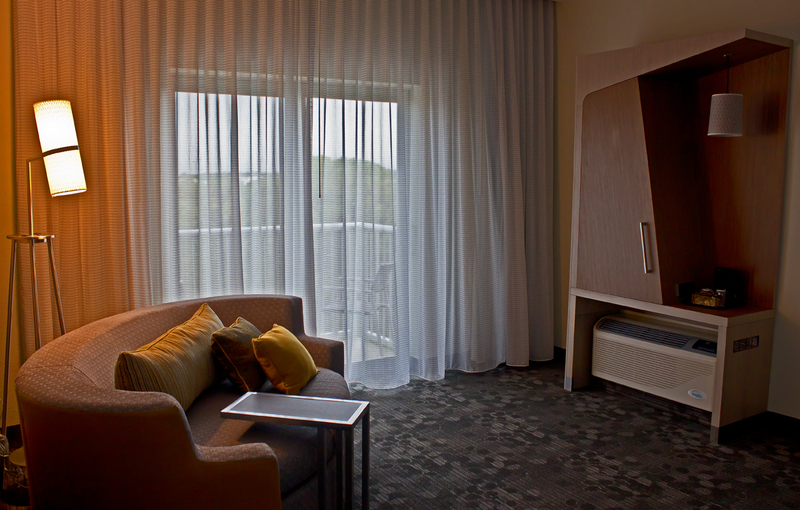 Overall, we had a fantastic stay at the Courtyard Marriott Palm Beach Jupiter hotel. The staff were friendly and always pleasant to deal with and the updated Cynergy design scores major points from this tech-savvy, millennial. I can’t wait to see more Courtyard’s around the US start to adopt this sophisticated, new look to keep up with the changing demands of todays modern traveler. 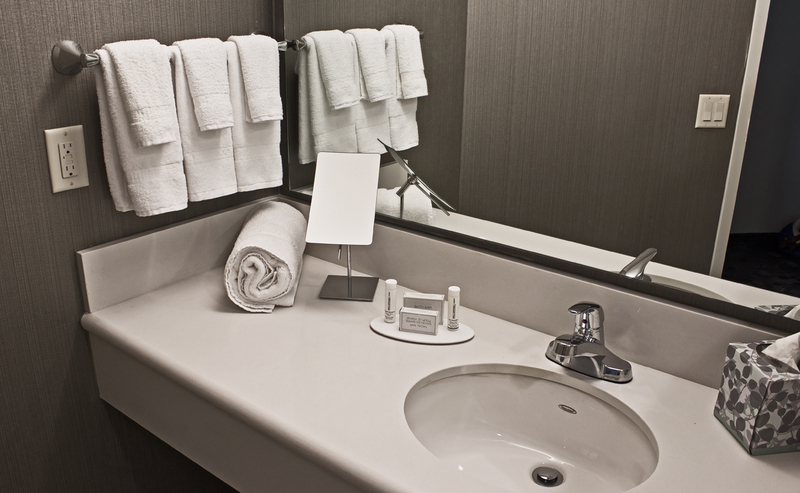 What is your one MUST have at a hotel? *Courtyard Marriott Palm Beach Jupiter kindly gave me a complimentary room as part of the Wish You Were Here – Florida campaign, but all opinions are my own. Love this hotel! I want to go stay there now! The outside is so cute and I could definitely see myself lounging by that pool for an afternoon. It was super cute, it seemed more like an apartment complex than a hotel which I loved. Definitely great for tech-crazed bloggers *hint hint* haha. Love the abundance of chargers in the room and the spacious layout! Complimentary Wi Fi is a big must have for me and a lovely bathroom where I can spend hours in haha 🙂 looks like you had a great time! It’s funny how much I depend on wifi in a hotel room now! Bathroom isn’t too big an issue for me, but stand-up showers I loveeee. I miss them being a normal thing in Australia. I hate tub showers here in the US. I wasn’t that picky about hotels until I stayed at a luxury one once in Ubud. They had super once hotel robes. Now I must have nice hotel robes. On top of that, it turns out I do not hate luxury! Haha, I stayed at a luxury hotel a few months back and became obsessed with their robes. I loved walking into the room after a long day, stripping down and wrapping myself in that plush robe – heaven! Turns out I didn’t hate luxury either! That’s a very nice looking room. Sounds like you had a great vacation. My must have is wifi. I need to be able to work from anywhere. Wifi really should be a complimentary inclusion with all hotels in this day and age! I also find that I usually have crappy cell phone service when I stay at hotels or on high floors, so my phone drops down to 4G or E, so wifi is always a big help! I love the design – that feature wall is stunning. And a moveable desk – that is amazing! Yeah, they’ve really given some great thought to their new design. The feature wall was soooo awesome!